Church of Christ? How may I obtain this information? In person or by appointment? 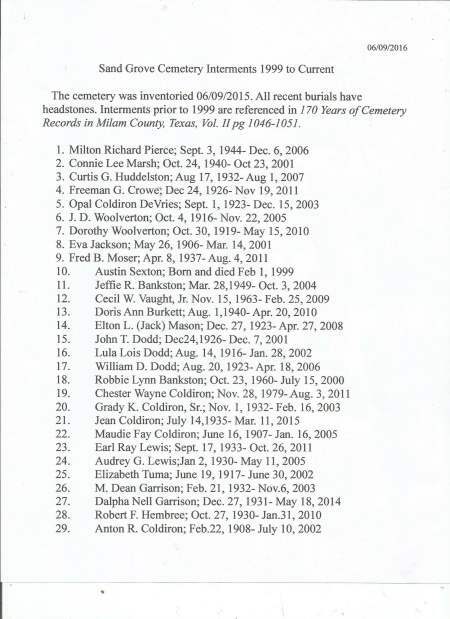 Years of Cemetery Records in Milam County, Texas" - Volume 2 - by Norinne Holder Holman. This list would not include the more recent burials, if any. I have also forwarded this email to the MCHC members and others interested in Milam County history. There will even be entries not in the 150 or the 170 year books. 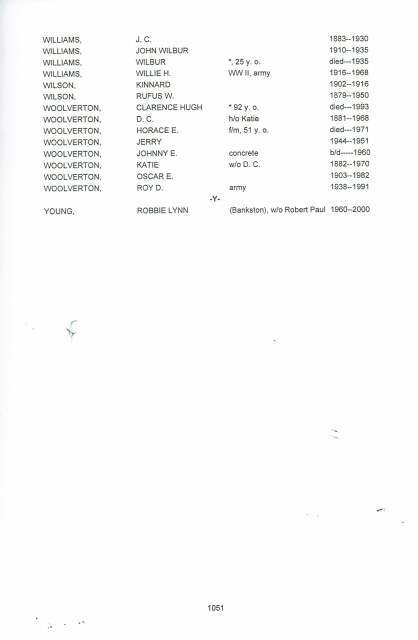 interments up until 2014-2015. The library is located at 201 Ackerman St., Rockdale, TX. 76567.
them might share the Sand Grove's Pastor telephone number. I had no success in this venture. Pastor or a relative that might be of assistance. There was no answer at that number. be happy to forward them to you. were noted elsewhere in the community so I assume that they were intentionally seeded. If I may be of further assistance, please feel free to reply to this post. response from Mr. Bobby or Rodney Coldiron regarding the personal letters that I sent to both of them. Sunday worship services when the Pastor is there. further if you provide the name of said individual. Jack, I was hoping to see if there were some of my relations buried there without markers. I am related to the Johnsons, Dodds and Lytles. My direct line is the Johnsons. with a marker or headstone. I appreciate all your help. 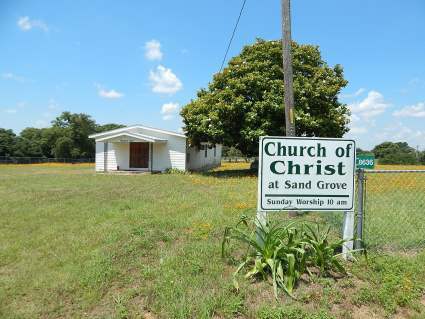 I have not heard from anyone with the Sand Grove Church of Christ and/or cemetery. sharing your info and emails with a cousin (Johnson) in Oklahoma. conservative headstone on his plot after 86 years (1930). 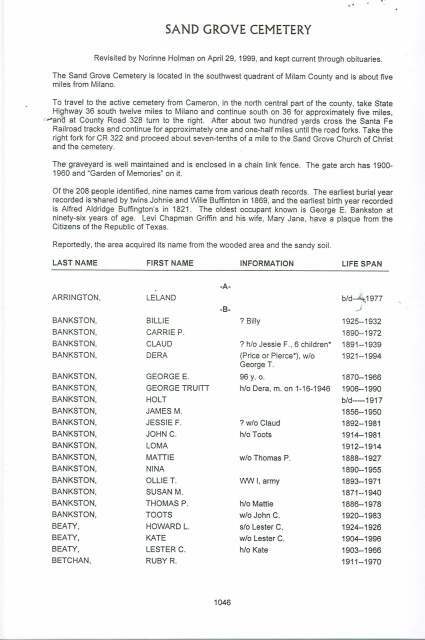 Chandler, McCormic, Chreisman, Bunton, Burks, White, Tumlinson, and many other early settlers of Old Texas. What is the book that you are referring to? Is it available to me at the local Houston library? under each cemetery that the surname appears to see if the given name individual was interred. your info and emails with a cousin (Johnson) in Oklahoma. surname's that goes along w/ the cemetery books. It lists all 235 cemetery's in which that surname is found. visit the cemetery at any time to take a look at the grave sites. Thanks for contacting my dad about this. Ms Jones, Thank you for your kindness in relying to Mr. Covington's inquire. documented all of the interments since he cemeteries inception. headstone inventory, I believe that all existing and legible headstones are inventoried. 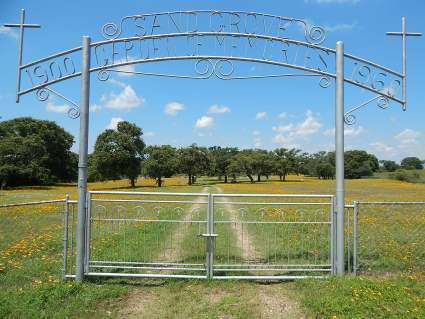 dedication to the continuing maintenance and preservation of the historic Sand Grove Cemetery. Ross relations are buried close to each other there. Holman. I am trying to make the time to get downtown to visit the library in the next few days. able to reconstruct a knocked over, broken and buried tablet headstone this way. and double nut again at the top. You're now ready to treasure hunt. I revisited the cemetery today and attempted to find the remaining pieces to the broken headstone in question. headstone/footstone. Thomas's headstone was previously inventoried. but it appears that it just wasn't in the stars. 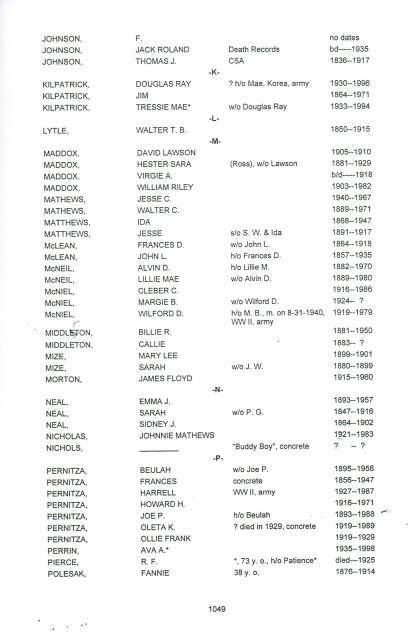 Mr. Covington, I checked with my dad and the partial list he has shows that grave to be unknown. My husband and I went and looked at the site because my husband and dad said there were some pieces of stone that had been moved to mow but we could not find any of those pieces. They may not have even been to that headstone but we thought we would give it a try. If I find anything else out from anyone else, I will let you know. Sorry. Mr. Covington, I will check with my dad and see if he has anything on this. 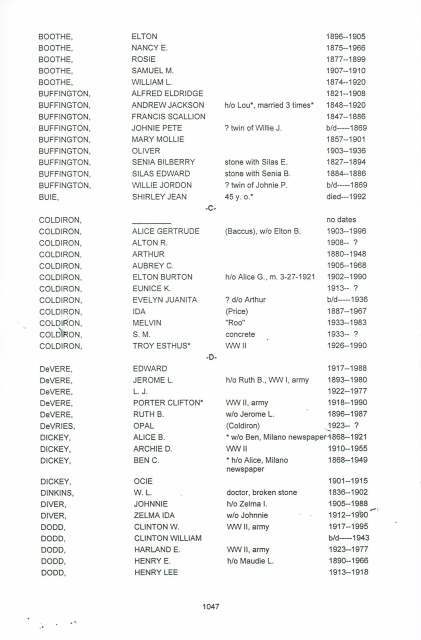 My grandfather, Alton Coldiron may have possibly told my dad who was there. I will let you know what he says. Have a good day. Jack,I really appreciate all your efforts in securing information for me. I have been to the Sand Grove Cemetery on 2 different occasions and photographed all those markers that were my relations (at least those that I knew were related to me).I am sending you a photo that I took that I am trying to identify who is buried in the plot. It is close to Thomas Jefferson Johnson Jr (my great-great-grandfather's brother) will also cc to Ms Jones to see if she knows who it is. 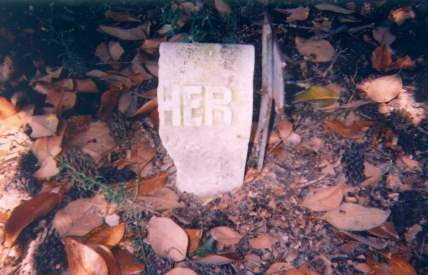 The stone appears to had the last letters HER across the top and what appears to me HNSON and the number 22 at the bottom of the stone marker. 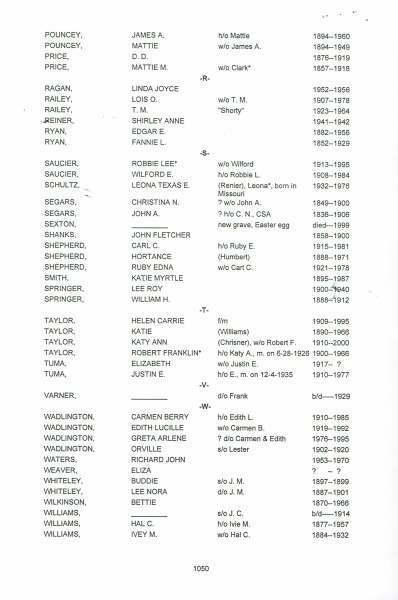 Could this be F Johnson (I have no clue to who that might be) from the list that you sent me of the interred at Sand Grove. There is a large cedar tree at the head of the marker and the Dodd and Lytle and Johnson and McLean and Maddox and Varner and Ross relations are buried close to each other there.I did find that the Houston Clayton Genealogy Library here has a reference copy (V1 and V2) by Mr (or is it ms?) Norinne Holder Holman. I am trying to make the time to get downtown to visit the library in the next few days. Ms. Jones, Thank you for your kindness in relying to Mr. Covington's inquiry. I did make a recent field visit to the cemetery and documented all interments since 1999 and added those not already documented to the Find a Grave website. 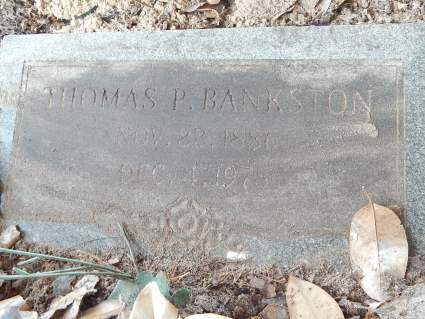 Since his families ancestry goes back many years in the Sand Grove Cemetery, he was not able to locate family headstone of some of those documented in the cemetery. As you know, some are illegible and/or broken. Some headstones may have never been placed at all or merely a stone placed. 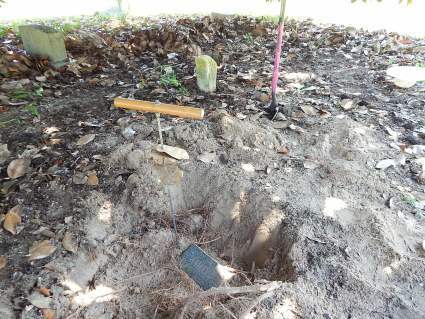 He was hoping for some sort of formal Church or Cemetery Association records that may have documented all of the interments since the cemeteries inception. 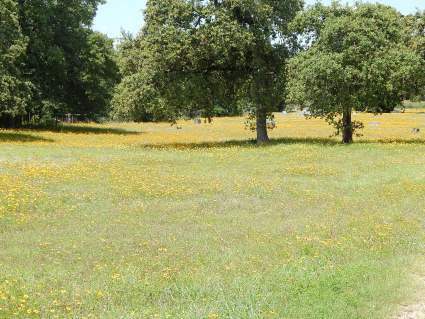 Between Ms. Holman's 170 Years of Cemetery Records in Milam County, Texas, Vol. I&2 and my recent headstone inventory, I believe that all existing and legible headstones are inventoried.